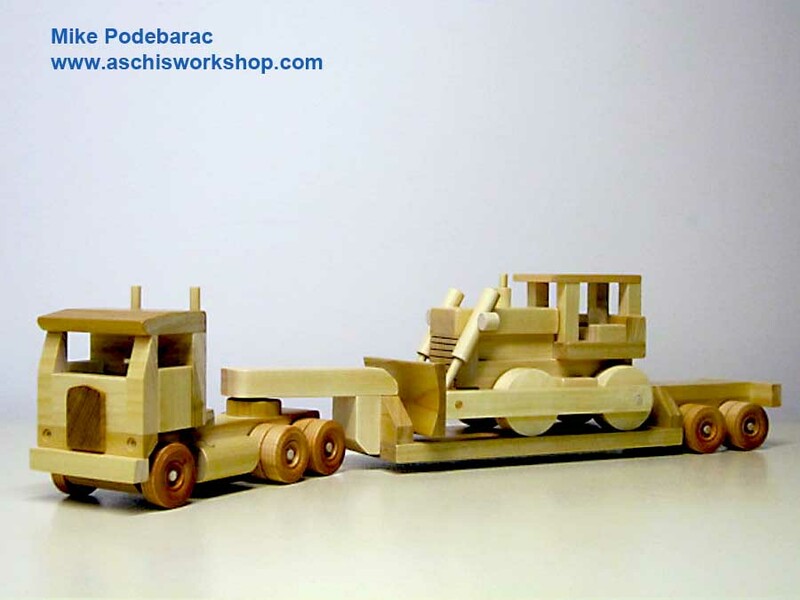 Aschi's Workshop is showing here wooden toys and models made from Aschi's Workshop Plans / Patterns. 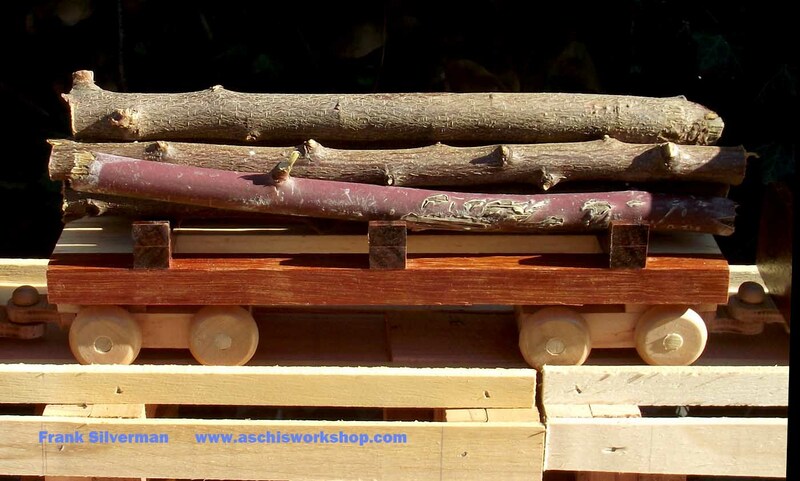 Aschi welcomes everyone to distribute to this page with pictures from wooden toys made from Aschi's Workshop Plans and Pattern. 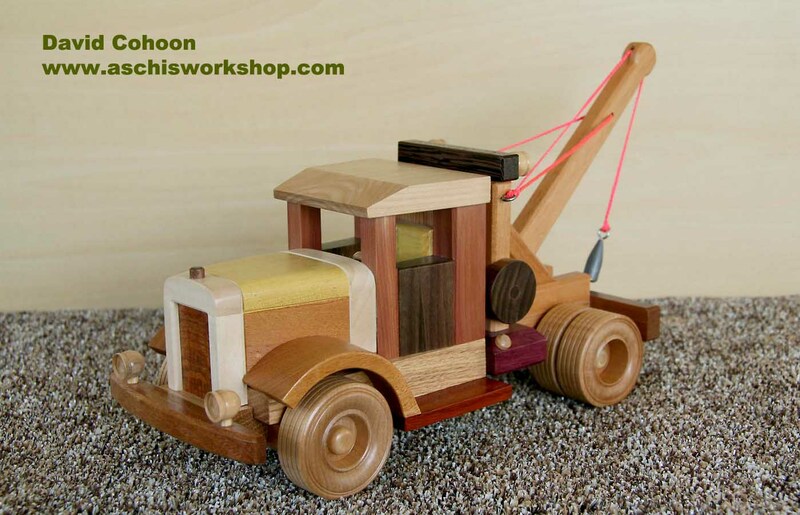 Aschi endeavours to make this to the largest page for home made wooden toys and models on the net. Check out Aschi's Workshop Plans/ Patterns. Over 150 patterns and plans to choose from. FREE PLANS and FREE Workshop Tips... click here. Kevin Kevin from the UK has sent pictures from models he built from Aschi's Workshop Plans. 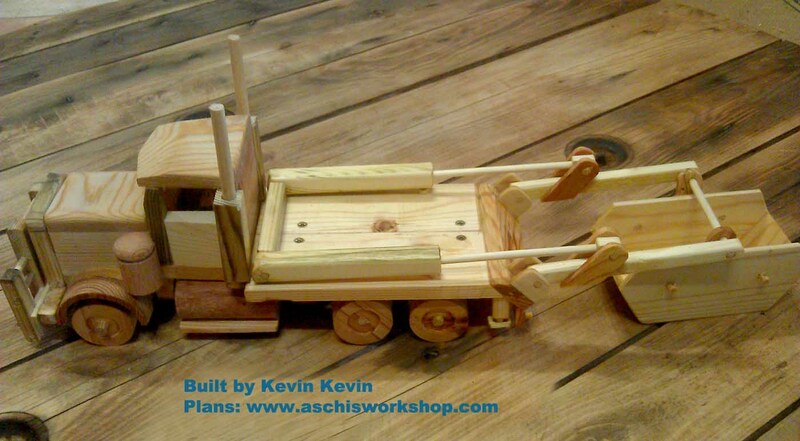 Kevin used the Plan #209 from Aschi's Workshop and converted the Road Tractor to an Skip Truck. Making Hydraulic Rams, Kevin used the FREE Workshop Tip #5 from Aschi's Workshop as guide. The plan for the BullBar is a FREE PLAN as well. Pictures from Kevin's workshop. A lot of parts and wheels... we can expect to see more models in future. 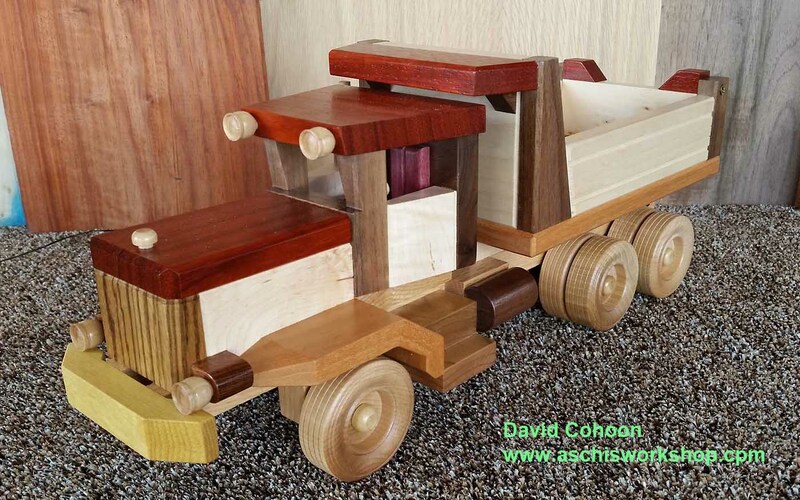 Kevin has built a number od trucks and trailers from Plans from Aschi's Workshop. 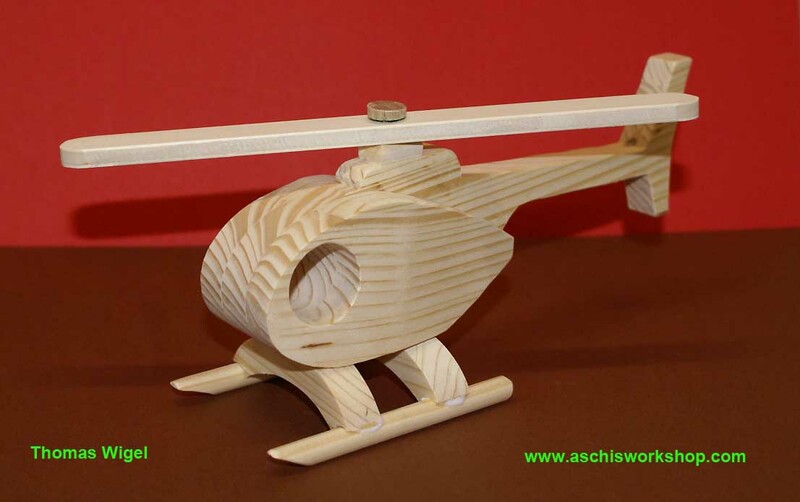 Brian Scammell from Canada is building toys and models from Aschi's Workshop Plans. 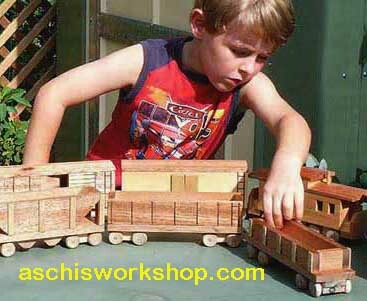 Aschi's Workshop has well over 150 plans on the web-page. All easy to build, different sizes and styles. Check it out today. Request your FREE PLANS today. and see for yourself. I live in Sydney and the Suburb is Revesby. I have been retired now nearly three years and have used your excellent plans for a few years now. The train sets took a while to make and decided instead of making one set to make10 sets this was a challenge but all good. Ian Nylander. 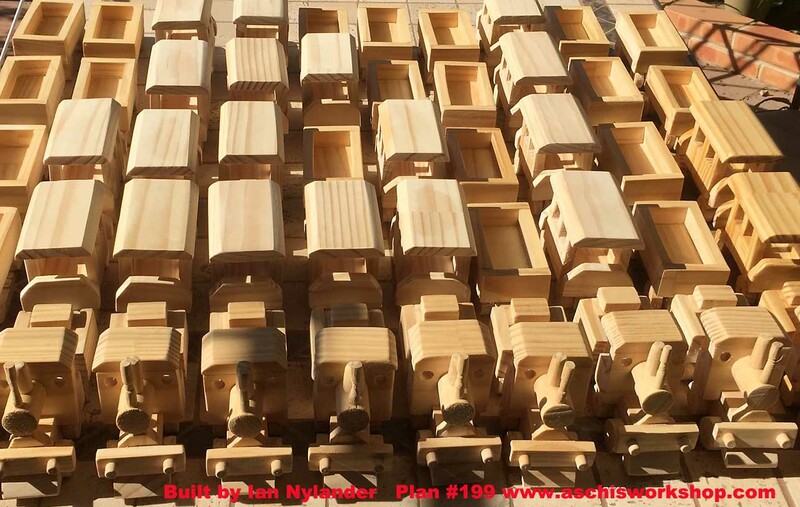 Check out the Plan #199 from Aschi's Workshop. The ideal Christmas Gift for everyone. 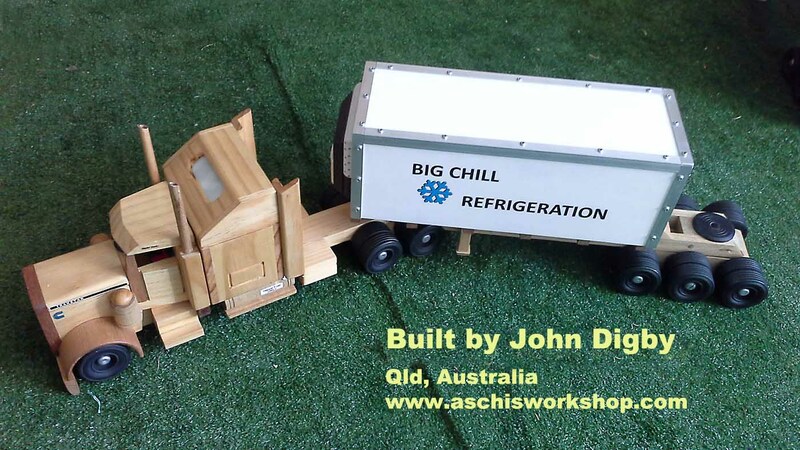 John Digby from Queensland, Australia has built the B-Double from Aschi's Workshop Plans. John has used the Plan #209 for the Tractor/ Prime mover and has made some alterations. 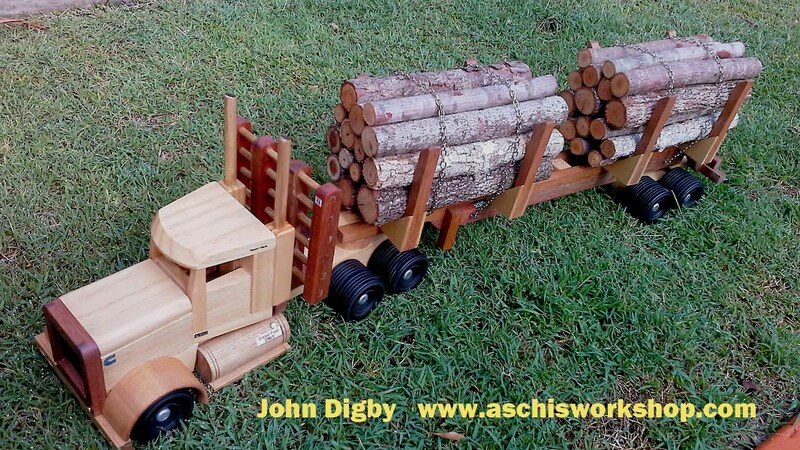 For the Trailers John used Aschi's Plan #211 (flatbed trailers) and made his own design. 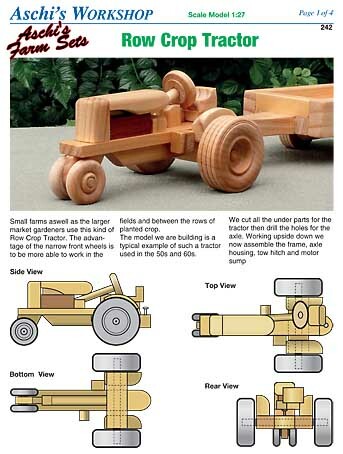 Aschi's Workshop has a number of exciting plans for Farm Models. Check it out and request your FREE FIRE TRUCK PLAN today. 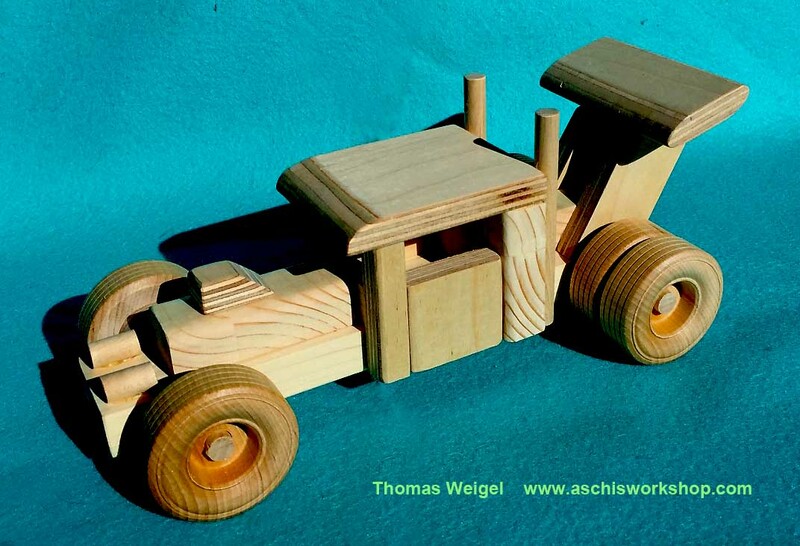 Graham New from Poole Dorset UK has built this tractor from Aschi's Workshop Plan #138. 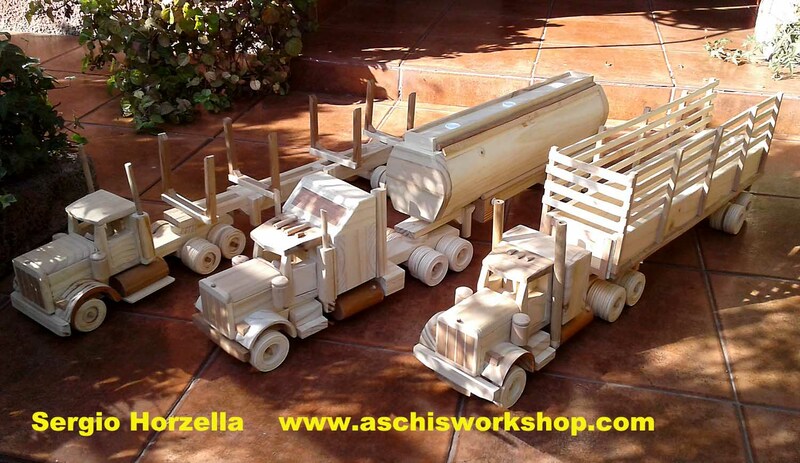 Sergio Horzella from Chile has buit the Fire Truck and the Dozer from FREE PLANS from Aschi's Workshop. 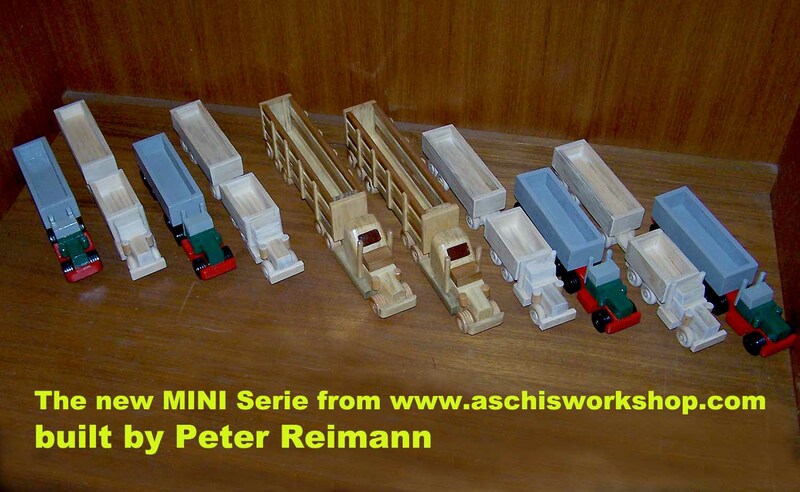 Peter Reimann has built the MINI Series Toys from Aschi's Workshop Plans. Peter builts also big models from Aschi's Plans. Doug House from Ocean Grove Mens Shed in Victoria, Australia has submitted pictures from his Work. All models made from Aschi's Workshop Plans. 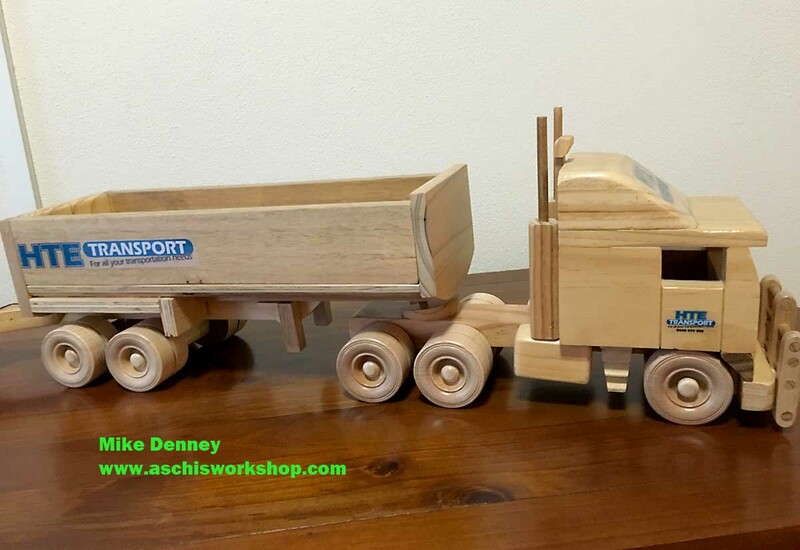 j.j. from UK made a truck and trailer from Aschi's Workshop Plans. Just thought i would say i have really enjoyed using your plans excellent and very easy to follow. 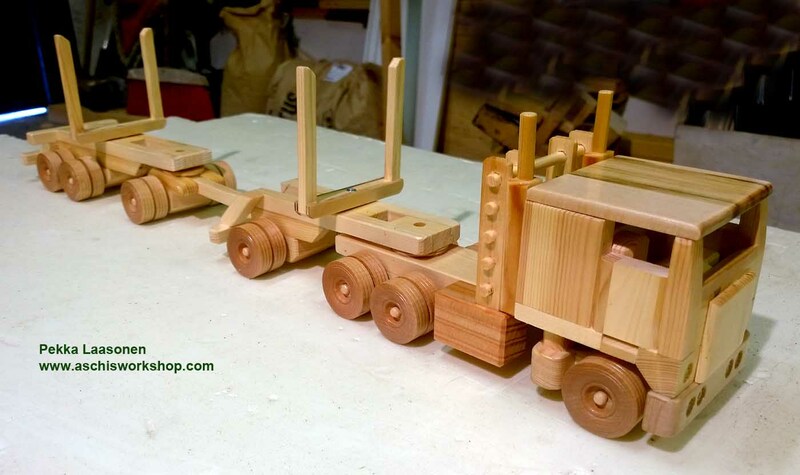 I decided to make this tractor and trailer but doubled the actual measurements to make it a big truck. 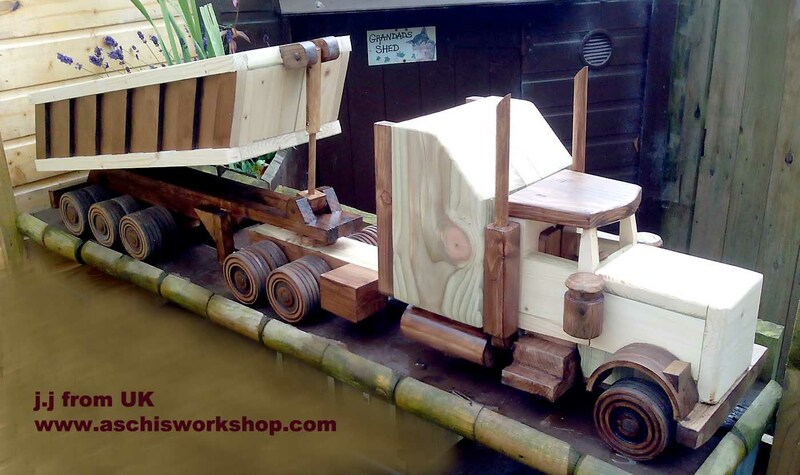 Yes, it is possible to double all measurements and make a BIG truck from Aschi's Workshop Plans. David: 'I used leopard wood on the grill, yello wood on the hood and seats. Seats are also rounded with grooves to give a tufted look. Also used paduauk, oak, walnut, maple, cherry, red cedar,ebony, mahogony and purple-heart. Mike Branagan from the UK: Thanks for the Aschi's Workshop plans for the LandRover. Here are some pictures I took. The LandRovers got built from Aschi's Workshop Plan #188. 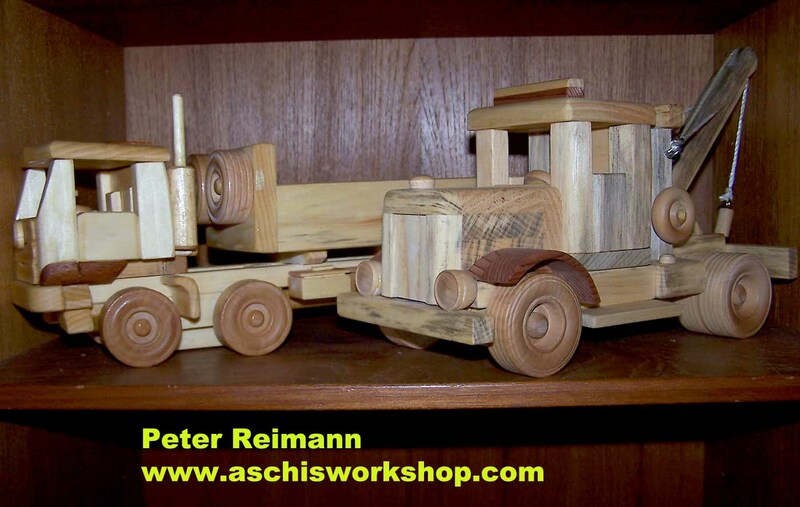 Thomas Weigel from Schuby / Germany has built the trucks and trailer from Aschi's Workshop Plans. 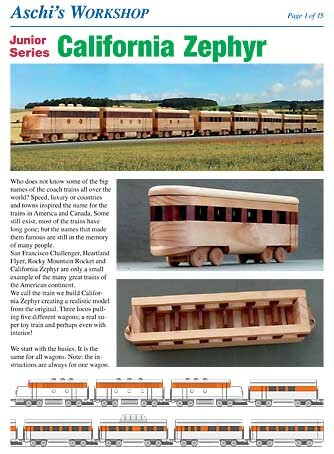 Thomas has used mainly plywood. Looks rather interesting. The Fire Truck on the trailer is a FREE PLAN from Aschi. Request your FREE PLANS today! 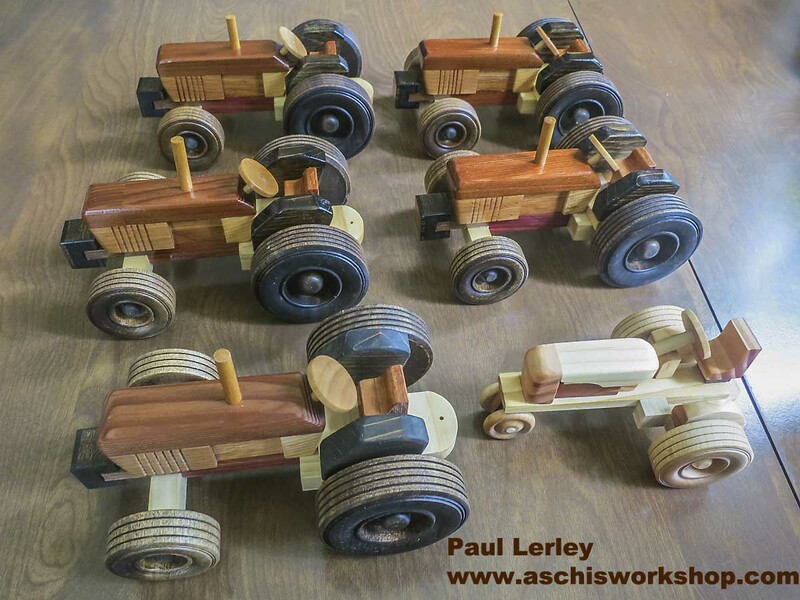 Bruce Bailey from Western Australia is making Hot Rod's from Aschi's Workshop Plan #121. The dark wood is WA Jarrah. 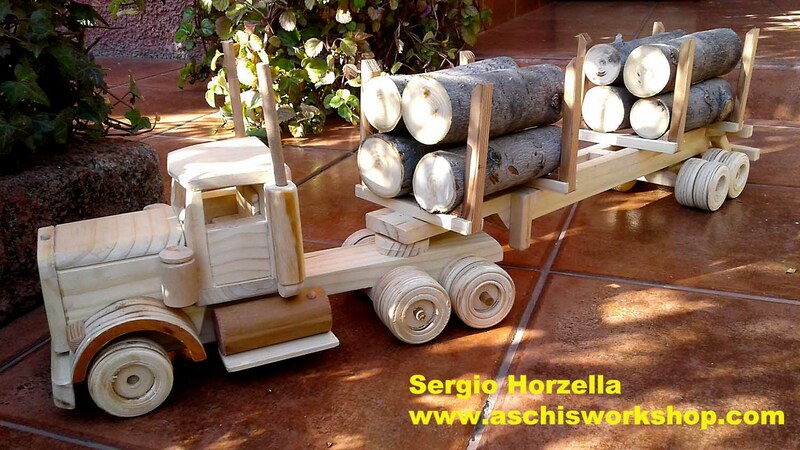 Sergio Horzella from Chile has built the logging truck from Aschi's Workshop plan #209 and #214.Great job Segio! All plans from Aschi's Workshop are PDF files and get send as e-mail to all places in the world. Try it out and request your FREE PLAN today. Klaus-Dieter Marotz from Hagen aTW, Germany has built this Western Australian Iron Ore Road Train from Aschi's Workshop Plans. Great job Klaus-Dieter. Mike Podrebarac from Des Moines, Iowa: Hi Aschi, I used your Free Dozer plan along with plans #136 & #169 to build 3 sets of this tractor/low boy/dozer combination from poplar and aspen. Mike: I copied the dozer modification originally submitted by Daniel from Townsville. 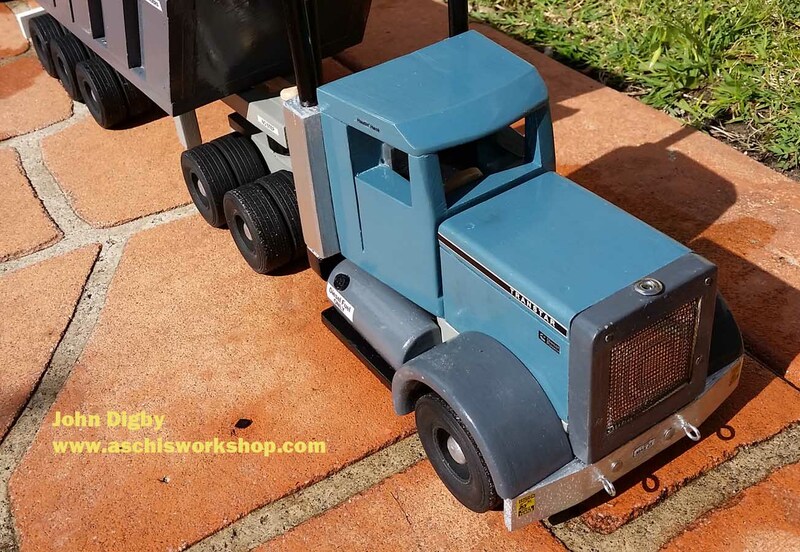 Have you requestet your FREE DOZER PLAN from Aschi's Workshop ? Chris Venter from Boksburg South Africa. 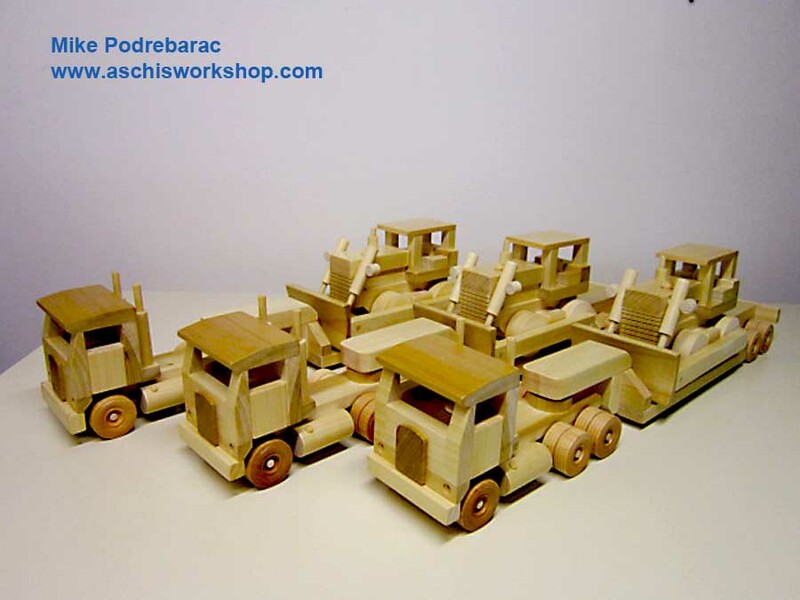 : Peter, here are some of the trucks built from Aschi's Workshop Plans. Found plans very workable. 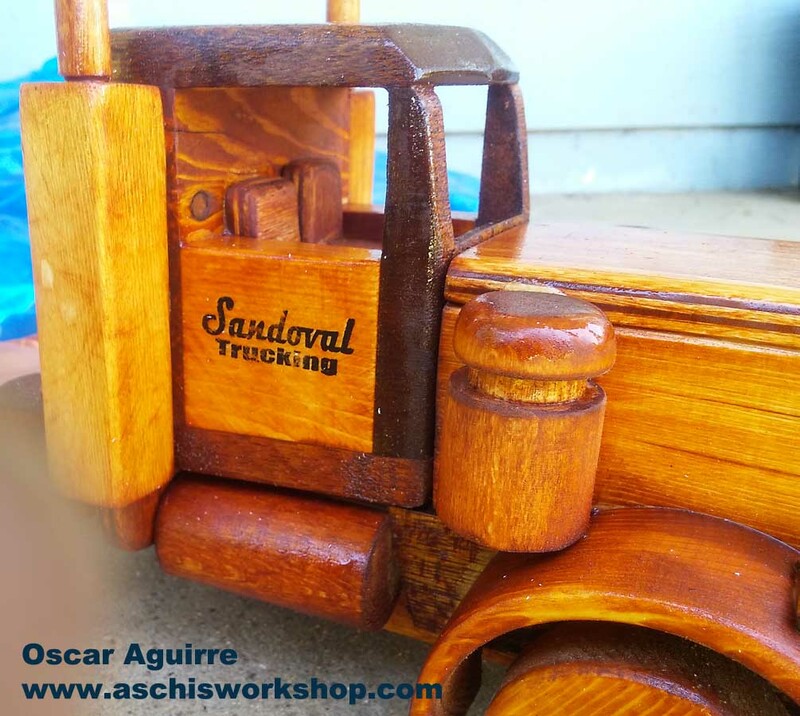 Chris has built a number of truck models from Aschi's Workshop Plans. 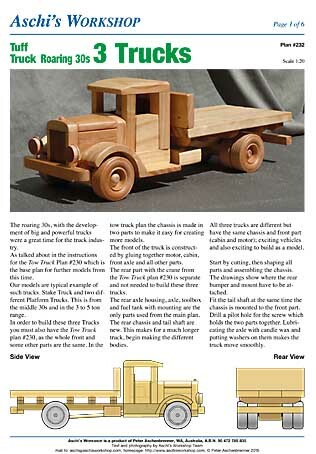 The oldtimer series, the FREE Fire Truck plan and also the plan from the News Letter. Have you requestet the FREE Plan from Aschi's Workshop? 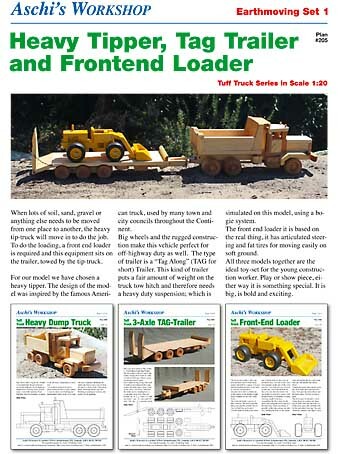 David Cohoon from Utah: Here are some pictures of the Heavy Dump Truck and the 3-axle Tab-trailer from Aschi’s plan #204 and #206. On all my toys, I use many different woods to achieve colorful toys. I used zebra wood, yellow wood, padauk, oak, walnut, purple-heart, maple, cherry, red cedar, ebony, and mahogany. Note the routed edges and strips of walnut on inside of bed. I try to put a little of me into all the projects I build. Some I keep and/or give to my grandkids and others I give away. Aschi's workshop Plan #204 and #206 is also awalable in a special offer as Plan #205 which includes the plan for this loader for FREE!! 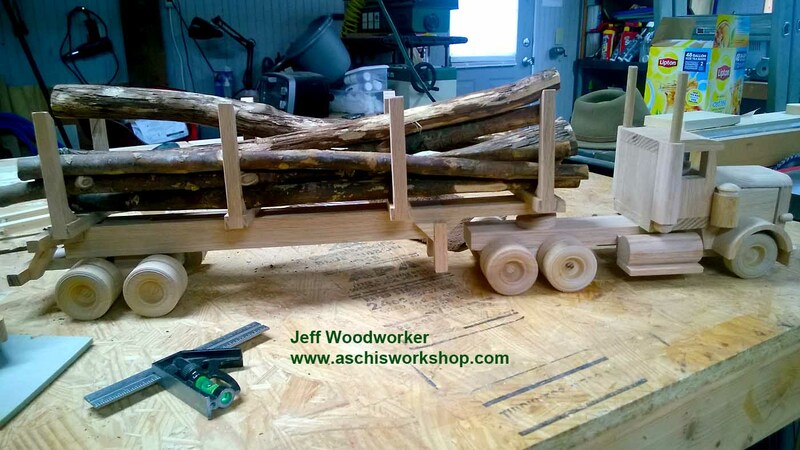 Jeff Woodworker: Hello Aschi, I recently purchased a plan from you and as with all others I enjoyed every minute of making it. So much so I made two. One for my grandson and one for my step daughter’s cancer benefit to be auctioned off. Everyone ask me how and where I got the design.... So I send them to your website www.aschisworkshop.com Again thanx so much for your plans and yourefforts to design new ones. 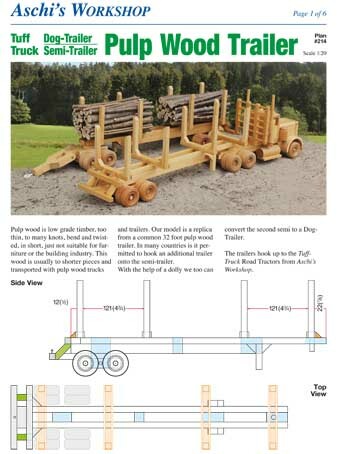 Pekka Laasonen from Finland has built this Pole Truck with single axle Jeep. 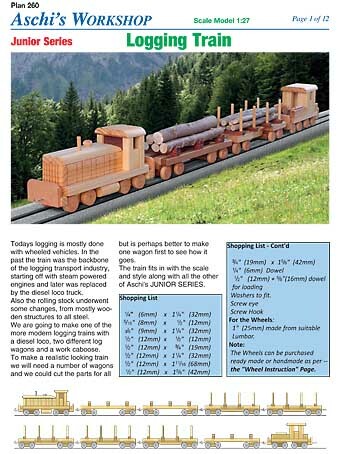 Pekka has used Aschi's Workshop Plans #149 and #214 and has created an authentic logging truck from Finland. Thomas Weigel has built the Aschi's Racer. A real fun project to make and to play with. 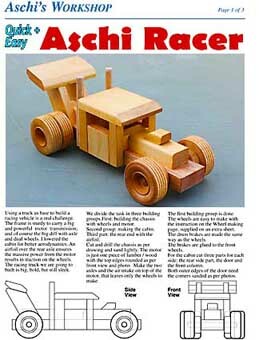 Aschi's Workshop Plan #185 is a easy to build Fun Racer. here the complete plan in a small version. 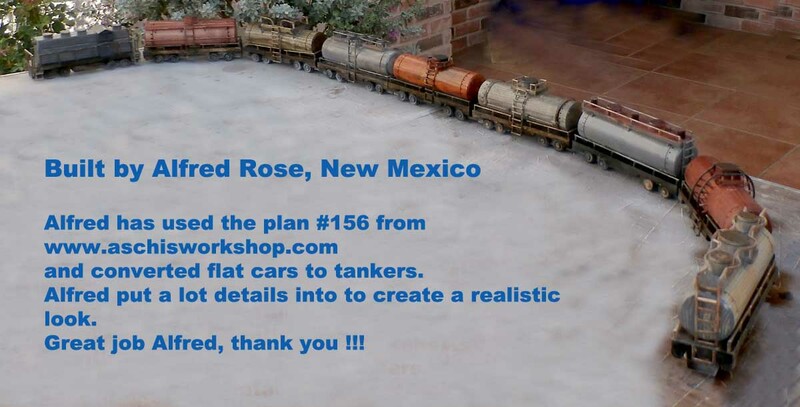 Purchase the Plan #185 from Aschi, is is only $4 US. 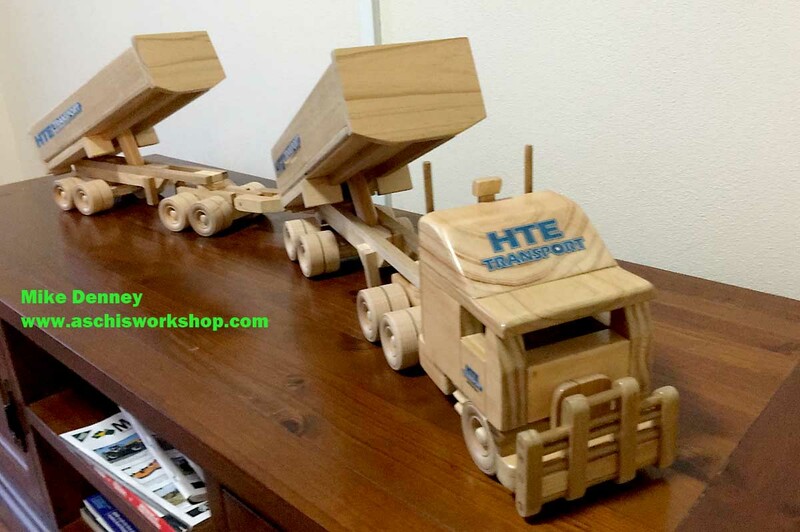 Thomas Weigel of Schuby, Germany is building toys for his 5 year old son.Thomas: "I started woodworking to make save and toxfree toys for my son". 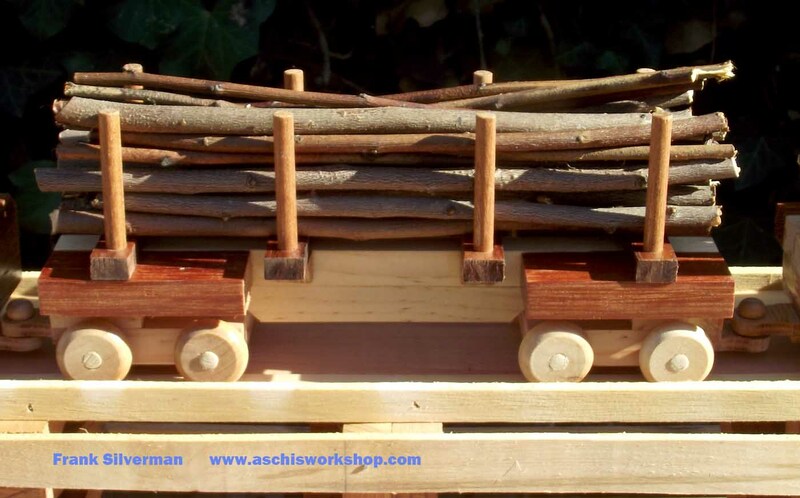 Thomas likes Aschi's Workshop plans: "incredible easy to work". The Dozer and the Fire Truck are FREE PLANS, The Helicopter is from plan #186. 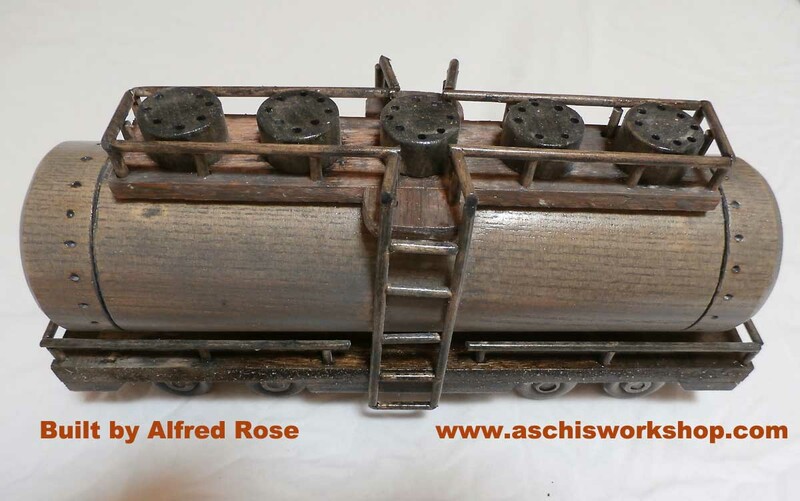 Peter Reimann from Ontario, Canada: I have included pics of my collection of aschi's models so far. It's been nothing but fun for an old gizer young at heart. 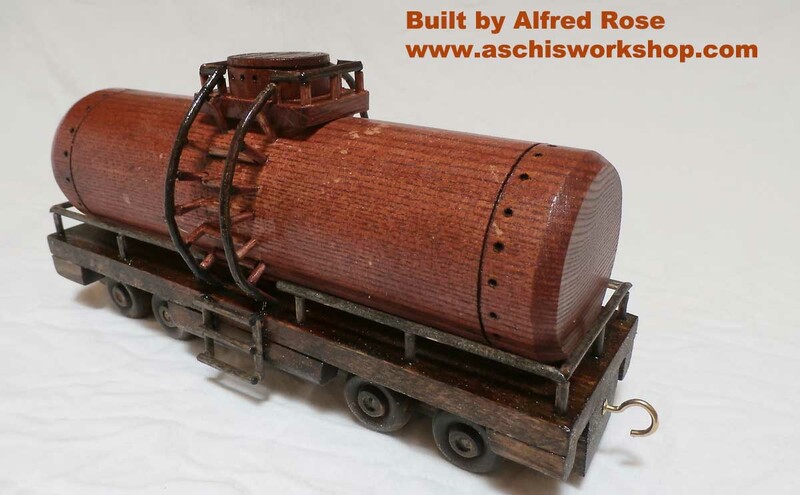 Peter Reimann is building this excellent models from Aschi's Workshop Plans. The Fire Truck is a FREE PLAN for you to test Aschi's Plans. Charles R. Smith from Canada: I own a sawmill, which is my retirement vocation. My grandson, Tobias, has the initials TTB. He was named after my Norwegian grandfather, Tobias Nelson Bjorndahl (initials TNB), who immigrated to Canada in 1904 and started a farm machinery company which he called the ‘TNB Machine Co.’. I chose the red paint on the truck stakes to serve as a background for the white lettering. It is the colour red found on the Canadian flag. I look forward to starting on the next truck model in the coming days. I do think you have done a great job with your plans. Graham New from Poole/ UK: ".... now back in making models..."
Graham is building model from Aschi's Workshop Plans. 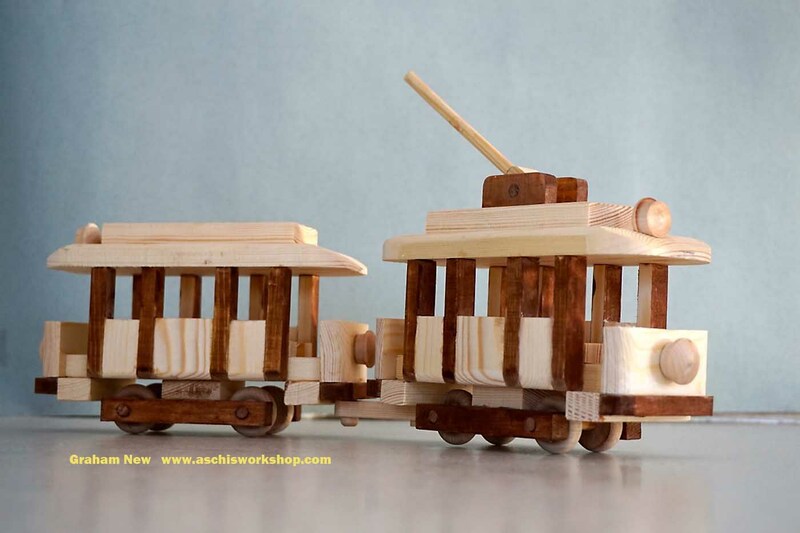 The Old Style Tram from Aschi's Workshop in a easy to build model in Junior Scale and goes with all othe Junior models together. 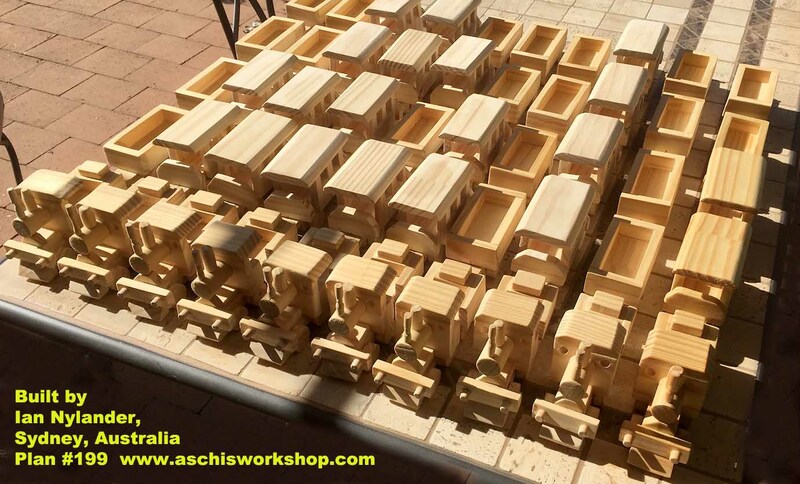 Check out over 150 plans from Aschi's Workshop and request your FREE PLANS today. from Queensland Australia: Hi Guys. Well I have only been a user of your plans for a short time but enjoy the end product or should I say my grandson does. Being a mechanic by trade in my working days and a frustrated carpenter by desire, I enjoy working with timber. I must admit I do put in a few alterations and added bits to try for realism. 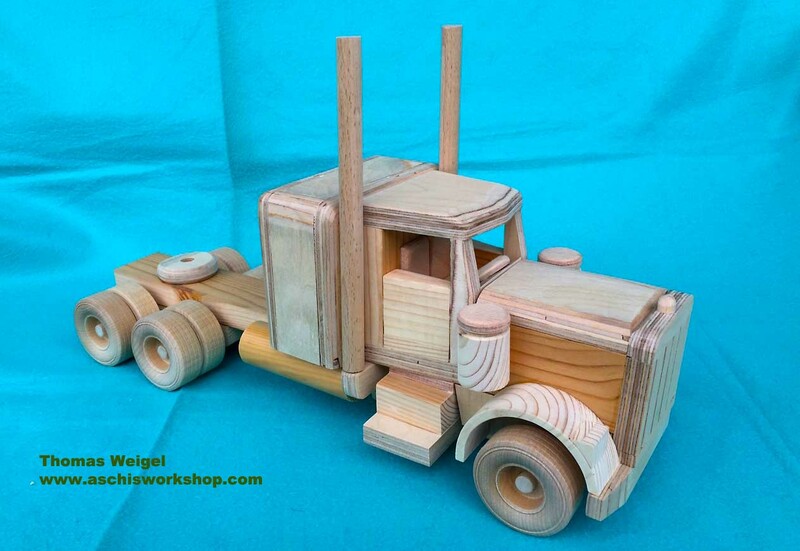 That came through in the ‘Road Tractor’ for the Pulp wood Trailers where I made the radiator and bumper bar somewhat different but was happy with the results. 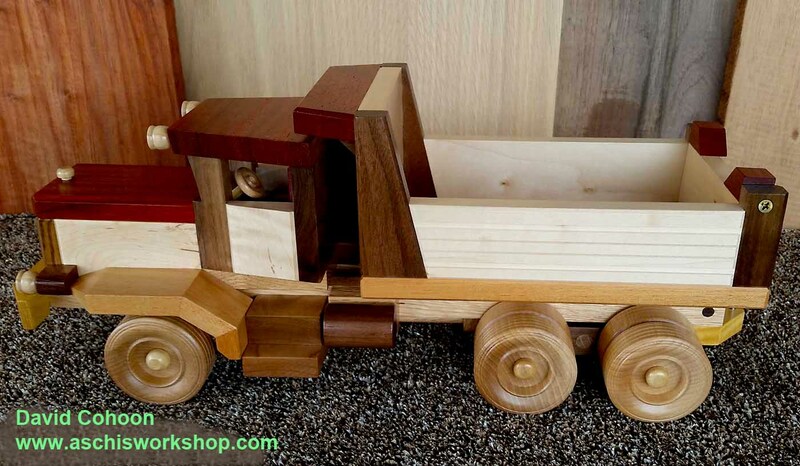 I find wheels, axles and other bits and pieces from Woodenjoys www.woodenjoys.net makes wheels easy and really authentic.